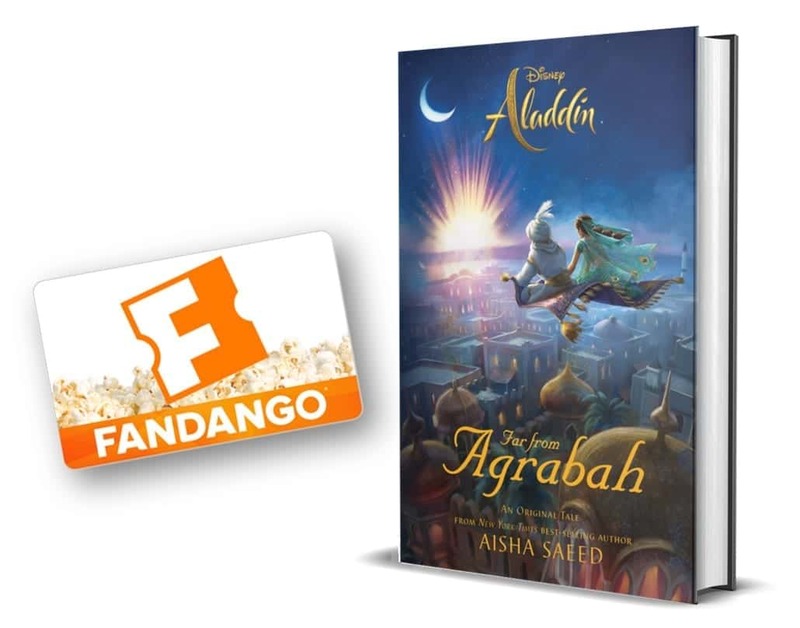 It's been a big month for Pixar! The ongoing Pixar Fest, the re-opening of Pixar Pier at Disney's California Adventure, and now the opening of Toy Story Land at Disney's Hollywood Studios. 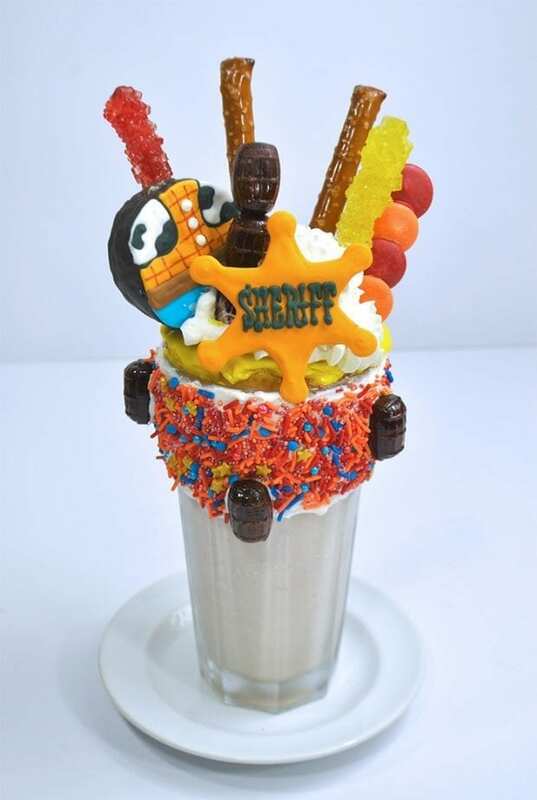 To celebrate all of this success I wanted to share some fun Toy Story themed extreme milkshakes (freak shakes). 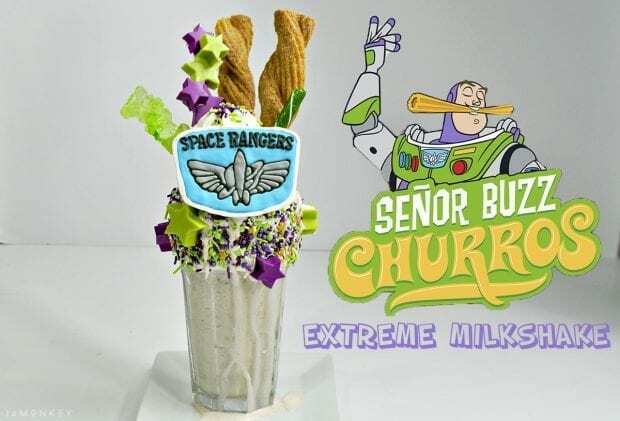 We have the Señor Buzz Extreme Shake to celebrate Señor Buzz Churros, a churro cart in Pixar Pier. Then a Sheriff Woody because when I think of Toy Story, I think of Woody and he is the first one you see when you enter into Toy Story Land. Let's start with our favorite space ranger! This is my favorite one because I LOVE churros. 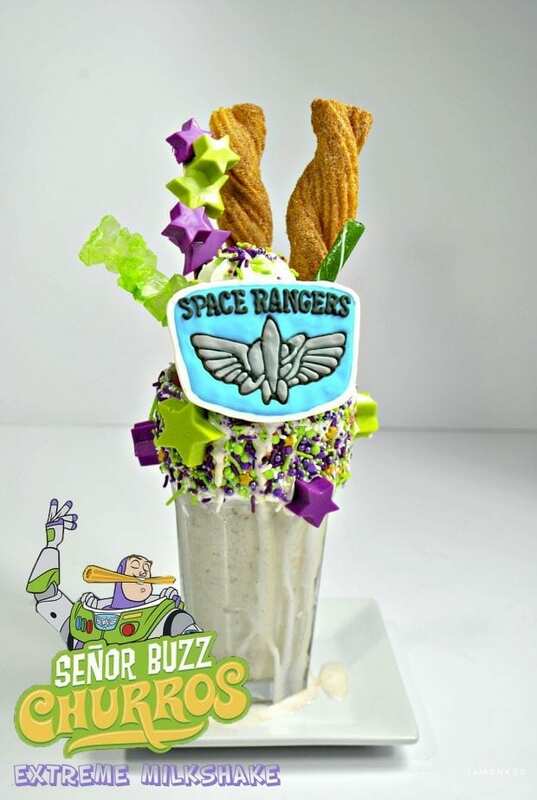 The Señor Buzz Lightyear Extreme Milkshake is a cinnamon vanilla milkshake. 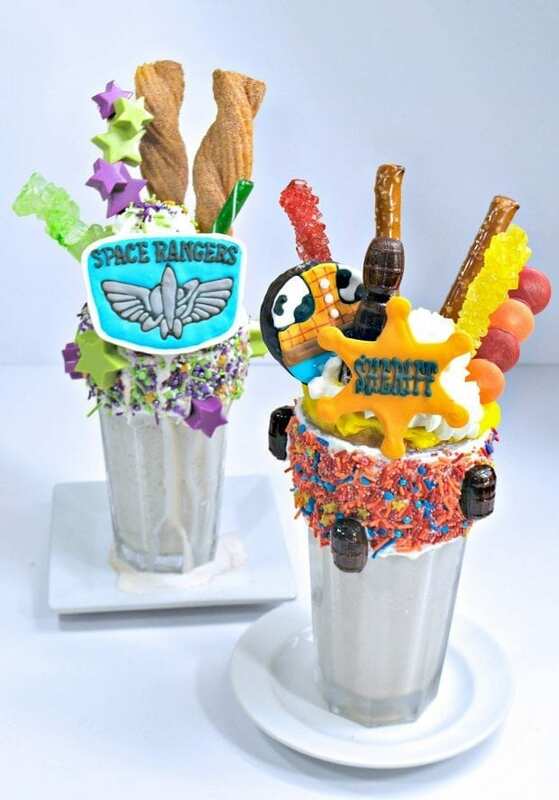 To make the Space Ranger transfer you'll want to print off the logo from online. 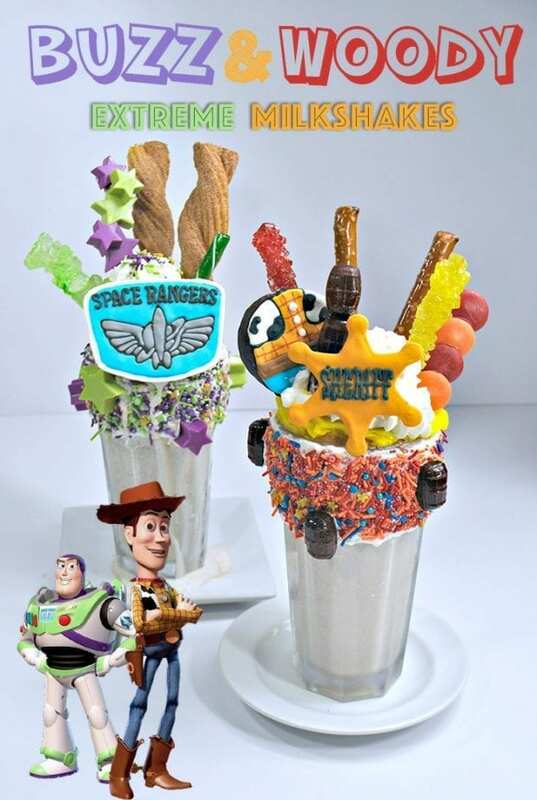 You can do this with any picture you find, and it's a fun way to make branded treats for themed parties. If you are using a complex logo, it will take a long time to make these so I suggest making them ahead of time. 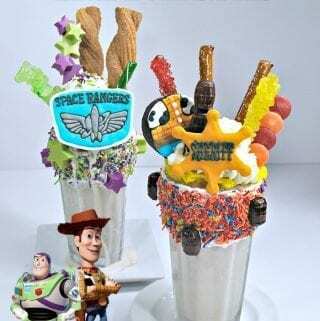 If you plan on making both shakes, I recommend breaking the icing up into more bowls so that you have all of the Buzz Lightyear colors and the Woody colors made and ready to make. Take your piece of paper and place on top of the image. Using a pen or pencil trace the image onto the white paper about 3-4 times 4 inches apart. Place the paper with the copies onto the cookie sheet. Fit a sheet of parchment paper onto the cookie sheet and tape the edges so that you have a smooth flat area. Using the standing mixer, combine the powder sugar, egg whites, cream of tartar, and vanilla and mix on medium speed. If the royal icing is still a yellow soup, add in 1/2 C powder sugar. Continue to mix until you get stiff peaks. Evenly divide the icing into the four bowls. In the first bowl, add about 2-3 drops of black coloring and mix until combined. The color you're trying to achieve is a light grey color for the rocket on the logo. Add in a few more drops of black coloring into the second bowl of icing. This bowl you want to achieve black so it may take a few more drops of black coloring to get the dark shade. In the third bowl add in a few drops of the blue gel color to get a light shade of blue. Leave the fourth bowl white. Scoop some of the black icing into the piping bag with the number 1 tip on it and set aside. Using the other piping bags with the number 2 tips on them, scoop a color into their own bags. Using the black piping bag, pipe out the lines of the spaceship and planet. Let the black lines dry for 10 minutes. Using the grey piping bag, fill in the lines of the spaceship and planet. Using the white piping bag, pipe out a border. Using the blue piping bag, fill the white border with the blue icing. 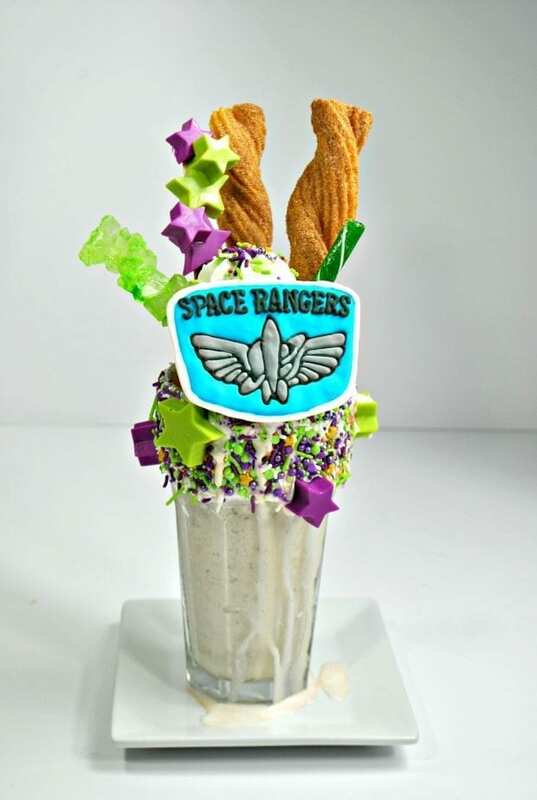 Let dry for 5 hours before using the black icing again and piping out the words “Space Ranger” up across the top. Set aside for one day to dry. Melt your candy melts as directed on the bag or use the Wilton Candy Melt Pot . Scoop some of the melted candy melts into the star silicone molds and set aside for about 2 hours so that the candy melts can harden. Make sure to reserve a small amount of the candy melts because you will need it later. Once the stars are hard, pop them out of the mold and place onto a cookie sheet with parchment paper. Using tape, tape two bamboo sticks together and cut about 1/4 of the sticks off. Using the melted candy melts, add a dollop of the candy melt onto the back of the stars. You will need about three big stars and three little stars. Alternating between color and size of the stars place them on top of the bamboo sticks. Allow them to dry on for about 1 hour. Using a butter knife and the white frosting, spread the icing onto the rim of your glass. Pour the sprinkles onto the frosting and lightly push down so that the sprinkles stick to the frosting. Add some leftover candy melt stars onto the sprinkles. 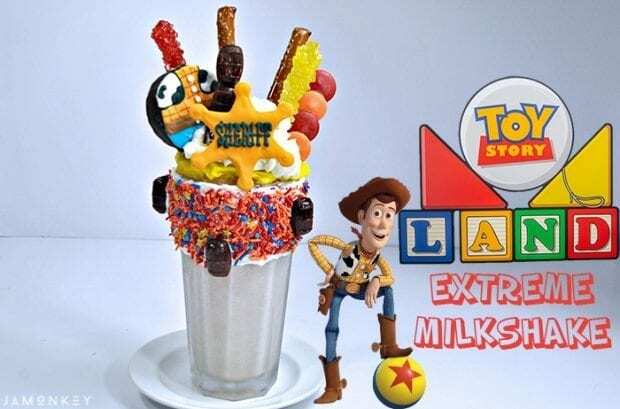 Now let's make the Woody Extreme Milkshake which is a Rootbeer Vanilla shake! 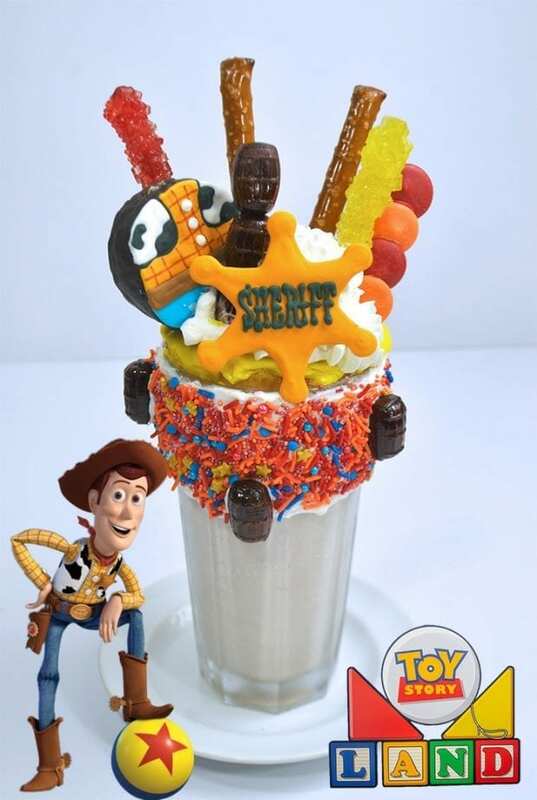 For this shake, we will make the Sherrif badge and decorate a ding dong to look like Woody. Follow the same directions above. Using the black piping bag, pipe a line in the top left and right corner of the ding-dong for the vest. Pipe some cow spots inside the lines and fill in with white icing. Pipe a gold outline around the vest and to the middle of the ding dong. Fill in with the golden yellow icing. Pipe an outline using the blue icing on the bottom half and fill in. Allow drying for 3 hours. Once dried, pipe on the belt using the brown icing. Using the red edible marker, draw the lines of the of Woody's shirt. Using the white icing, pipe on three lines going down the middle of the shirt. Set aside and allow to dry for 2 hours. Combine all the milkshake ingredients into the blender and blend until smooth. Place the donut onto the top of the milkshake so that it sits on the rim of the glass. Pierce the ding dong with a bamboo stick and place into the left side of the ding dong. Place the red rock candy behind the ding dong. Using two pretzel rods, place them into the middle of the donut. Place the Red and Orange candy melt stick into the right side of the donut. Place the Yellow rock candy into the right side of the donut in front of the candy melt stick. Pipe whipped cream into the center of the donut. Place your rootbeer stick candy into the left side of the frosting. Carefully place the badge icing transfer front and center on the whipped cream. you said ding dong. LOLOLOL. But seriously, these are GORGEOUS. I love the slideshow you did!